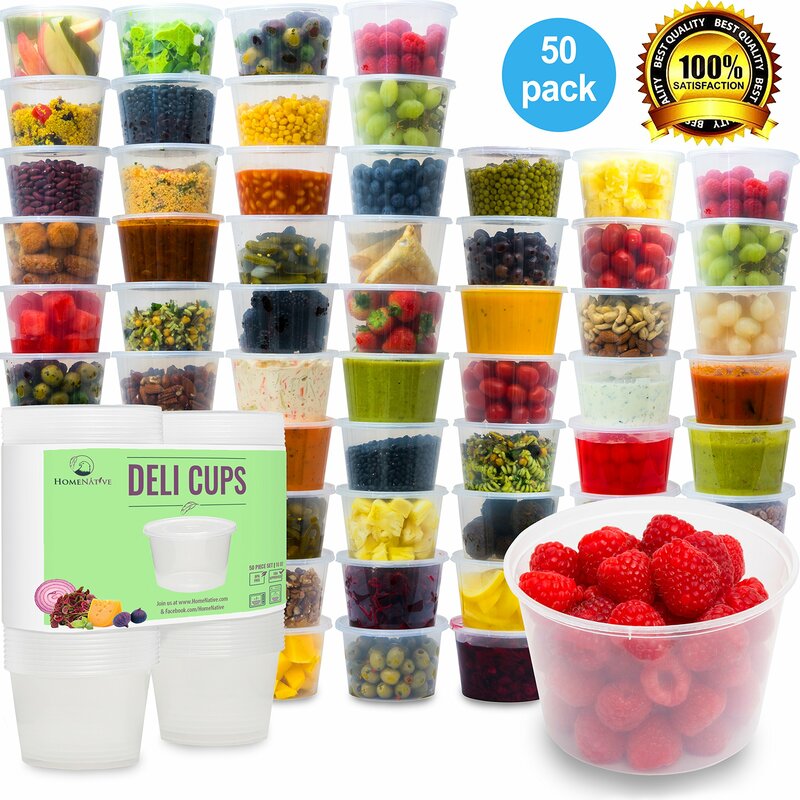 Home › Home and Kitchen › Plastic Food Storage Containers With Lids - Restaurant Deli Cups / Foodsavers.. Plastic Food Storage Containers With Lids - Restaurant Deli Cups / Foodsavers..
VERSATILE PLASTIC FOOD STORAGE CONTAINERS - These 15.2 oz round clear plastic food storage containers (outside diameter 117mm, inside diameter 112mm) are ideal for a variety of uses including as restaurant & deli supplies for takeout, everyday kitchen foodsavers, kids lunch boxes or even for carrying meal components separately as a substitute bento box! Perfect for portion control meal prep and a great alternative to 21 day diet containers or Tupperware! FEATURES - These premium FDA Approved and BPA free Polypropylene (PP) food containers are microwave safe, allowing for convenient reheating of food in seconds without melting or warping. Also freezer safe down to -20F and suitable for long term food storage, allowing you to make batches of homemade food and store for freshness. Suitable for hot foods up to 120F. They are easy to use and easy clean, with a gentle hand wash recommended to maximize the longevity of these food containers. FEATURES - All our containers have snap lock lids / covers for a leak proof, watertight seal, keeping delicate foods fresh and contained. As well as being reusable and extremely durable these stackable containers nest together to save space when not in use, while their interchangeable lids also fit our 8.5 oz containers. All in all one of the best food containers on the market right now! MULTI-USE - As well as being great for storing small portions of restaurant take away leftovers these containers are great for keeping snacks handy while on the go, and also make excellent party buffet bowls! They are ideal for storing a variety of foodstuffs. Simply stack in your fridge or slide into your gym bag. Take to school, work, camping, hiking, gym or even golf! Think outside the box! Also great for storing jewelry, arts & crafts and fine motor toys! LOOKING FOR A WAY TO KEEP YOUR FOODS FRESHER FOR LONGER AND SAVE MONEY IN THEPROCESS? HomeNative Brings you the Solution! NEW: 50-Piece Microwaveable RoundPlastic Food Container Set CONTENTS â€¢ 50 x 15.2 oz Round Plastic FoodContainers (117mm outside diameter, 112mm inside diameter) FEATURES â€¢ Madefrom premium Polypropylene (PP) â€¢ Clear, so you can see exactly what's insideâ€¢ Snap lock lids for a leak proof, watertight seal, keeping delicate foodsfresh & contained â€¢ Reusable â€¢ Stackable â€¢ Interchangeable lids â€¢ Microwavesafe to allow for convenient reheating of foods â€¢ Freezer friendly andsuitable for long term food storage â€¢ FDA Approved & BPA Free USES â€¢ Ideal forrestaurant & deli supplies as small to go boxes or deli cups â€¢ Great foreveryday use such as kitchen foodsavers, carrying baby food, kids lunch boxesor as party buffet bowls to name just a few! â€¢ Take to school, work, camping,hiking, gym or golf! â€¢ Fit inside your cooler for that perfect picnic â€¢ Thinkoutside the box! Also great for arts & crafts, jewelry and fine motor toys!Get Yours Today and Join the Thousands of Happy Customers! But HURRY as stocksare selling fast & won't last! ORDER NOW to start benefitting from theseconvenient food containers!